When I was a kid, I used to think that wind was made by trees, who collectively decided to move air around by shaking their branches. I used to believe that by the time you had grown up, you would get a new name, because to me there were names for kids, like mine and that of my brother and sister, and names for adults, like that of my parents and grandparents. At four, I didn't think that one could long for a whole closet full of shoes, because the only thing I wanted was a pair of black lacquer ballerina flats. Back then I was sure that inside my grandma's clock there were two goblins throwing the pendulum to each other, like if they were playing table tennis, and sometimes I felt sorry for them because I knew they were really tired. I also used to think that on Saturday night it was required to eat pizza, and I used to believe that this one was the only cake possible. Certainly to me it was the best cake in the world. The first time I ate it was here, a summer afternoon of many years ago, at a time when me, my brother and sister were still forced to have the same haircut. When our hair got too long, my mum would put a bowl on our head, upside down, trying to pair the edges with fine scissors' strokes. Now that I see the cake again, covered with cream puffs or chocolate icing, I think that both of those variations must have been a lot tastier than this one. Yet, the version with whipped cream and sliced pineapple is the one I remember the most and to which I'm more attached. Maybe it's because me and my brother would always fight to get the pineapple juice that was left in the can, right after licking what had remained of the pastry cream on the wooden spoon. Its name was Torta Margherita (literally Daisy Cake, it's Italian for Sponge Cake) and it was really special because my mum would always make it for our birthday (and for our birthday only). I know for a fact that if you ask my brother and sister which is the dish from their childhood that they remember with the most salivation, they will put this cake in the top three as well, along with the rabbit with salame and chicken liver and the white cannelloni we used to have for lunch on Sundays. Few years ago I copied some recipes from the old family notebook and I stuck them in my suitcase. But I've never wanted to try any of them, whether because I was too lazy or because I felt some sort of awe. Up until today, when I finally made up my mind, and it was the best gift I could get. type 0 flour 75 gr. In a bain-marie, beat the eggs with the sugar and the vanilla sugar until the mixture gets white and firm. Remove from the stove and keep mixing until it cools off. Sift flour with potato starch and baking powder and add to the egg mixture along with the lemon zest. Pour in the baking form, properly buttered and dusted with flour, and bake at medium temperature (350) for approximately 35-40 minutes. When the cake has cooled down (it's better to do it the next day), sliced it in three layers and moisten them with some rum, diluted in warm water with a little sugar. Bring the milk to boil with the vanilla stick, scraping out the seeds. In a separate bowl, beat sugar with the eggs and egg yolks. Add sifted flour, mix well and then pour the batter little by little over the hot milk. Stir well and cook at low heat for about 10 minutes, always stirring. Let it cool down, add butter and mix well until melted. Divide the cream in half and add the lemon zest to one half and a couple of teaspoons of cocoa to the other half. Fill the cake with the two creams, one per layer, and reassemble it. Whip the cream with the confectioner's sugar until it gets very firm, then spread it evenly over the cake. 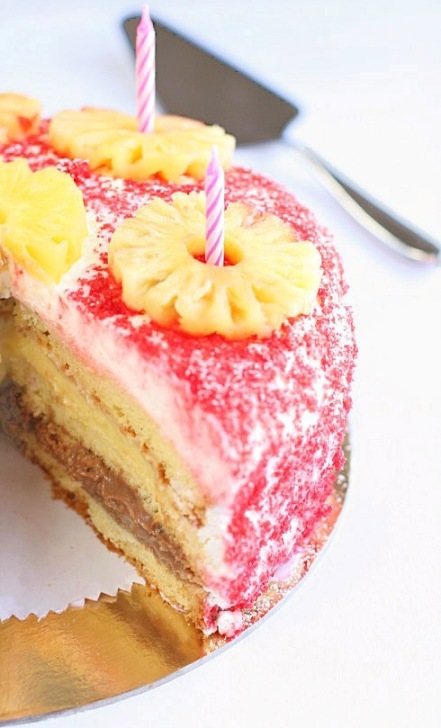 Garnish with coloured sugar crystals and pineapple slices. If you're interested, I'm copying here the recipe for the chocolate icing, exactly how I found it in the notebook. Chop the chocolate bar and let it melt in a pan with a little water. Add a bit of oil and stir until mixture is fluid. Let it cool down, then cover the cake.